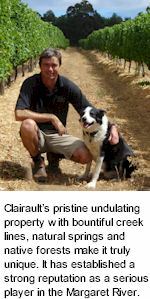 Cabernet Sauvignon by Clairault of Margaret River. . Margaret River makes mighty Cabernet but Clairault make a priority of gentle winemaking. Vinified on skins for optimal extraction and treated to a timely ten months in nothing but the finest French oak, a vivid articulation of Margaret River Cabernet, brimming with dark blue currants and cassis, its refined minerality resolving on a refreshing glace cherry finish.